This week’s low level mission is Saving A Dou. It is part of the Zhuge Liang quest chain (“Kill Yin Ming”). Like all 3k missions there are a lot of monsters, more than in a typical Troy mission, but they are somewhat weaker. It is one of the “push forward” missions like Hidden Power or Flamethrower. If you call up the map window inside the mission you see two towers (marked “T” in my map). Allegedly they should attack your party but they haven’t done a thing in my mission run. May be they were afraid of my big cannon. But they had no reason to, because you can’t attack them either. Another weird thing is that the final boss is Yin Ming, at least according to Zhuge Liang’s – as usual much too long – monologues. In the objective window the final boss is called Ahn Ming. The first real obstacle is the gate/stairs area (F-H 10). At the well in I10 a mini-boss will spawn if you enter the white glowing patch (Xiahou Yin). Take care that you trigger him only after killing all the monsters in the vicinity. All in all it was fairly simple for my average geared level 97 musician main/witch party if you do the usual. The usual being: patience until witch is loaded meteor-strike-wise, then bamm. If you have climbed the last step of the stairs (marked “Stairs” in the map) scroll – there is a nasty net trap. The long stretch from I6 to I4 is a bridge where now, after the Spelltower patch, the monsters from the summon portal swarm towards you. That sounds awful but is better than before that patch because when you finally reach the summon portal it should be empty (or at least only one just spawned group standing there). 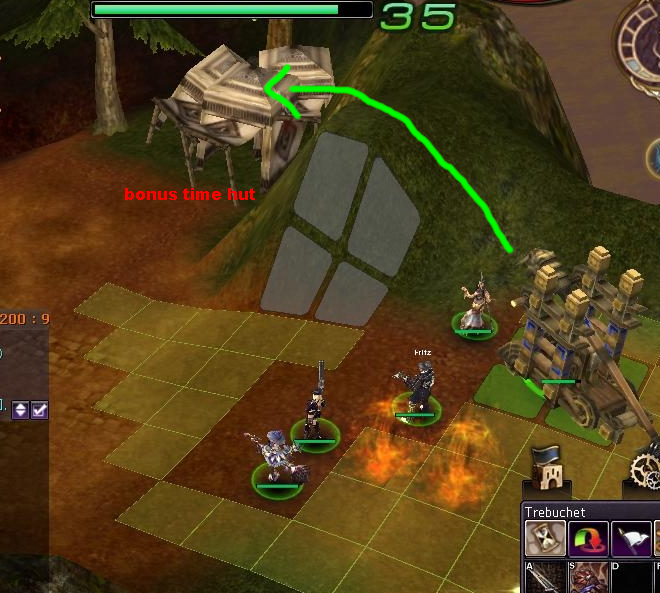 When you come near the boss area you see a hut to the right side. If you destroy it you get bonus time which you probably don’t need. Before you are two wooden walls (grey lines in the trap map). Just before the tower on the left behind the first wall is a flame trap. After the second wall there are some catapults. If you approach the second wall with your witch do it so that she is a bit to the right so that her meteor strike is not interrupted by running into the flame trap. You can avoid the flame trap by sneaking behind the second wall (see green arrow in the map). 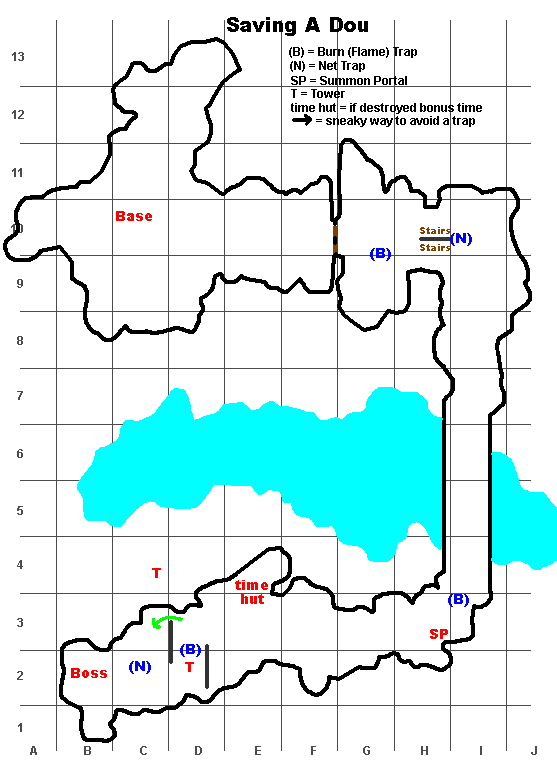 As always I tried to run in every trap on this map on purpose but I may have missed one or two. Especially because you get allies who run hither and tither and to and fro and whereever they imagine the naked women are. These allies run even highly motivated in every trap they find and burn for you. Nice mentality but annoying if you want to make a trap map. So help is appreciated – if you know a trap I have overlooked please comment. Here is a video of a run I did with my level 97 musician main. Please note that this video was done before the Spelltower patch. There is no time bonus hut in there and the monsters summoned by the portal behaved differently (they simply stood around and enjoyed to become part of an ever-growing lump of monstressness). But the lay of the land remained the same. If anyone needs an “after Spelltower” video please comment – I have one already done, but did not deem it necessary to upload it yet. Thanks for a great site. I am regularly here checking the maps and never thought to thank you for all the hard work and time you’ve taken. Whatever you say… You are obviously experienced in announcing the average equipment for mains/mercenaries. Please tell me: what gear would you think is average for a level 97 musician main?